The crisis over Crimea seemed a long way from the lives of the ordinary Russian and Ukrainian fight fans in the crowd at this World Series of Boxing quarter-final between the two nations’ franchises. If you're looking to escape political tension and threats of violence, a Russia-Ukraine boxing match wouldn't be the obvious place to go right now. But peace was exactly what was on display on Monday as Russian and Ukrainian fighters traded blows in Moscow – an unexpected moment of harmony at a time when relations between the two countries are at an all-time low. In a crowd ranging from shaven-headed fitness fanatics to elderly Uzbek women in traditional dress (apparently relatives of one of the fighters), spectators cheered on their own boxers with chants of “Russia!” answering calls of “Ukraine!” but were also ready to clap the achievements of fighters from supposed enemy nations. The defining feature of the night was “sportsmanship,” said International Boxing Association president Wu Ching-Kuo, in town for the match. The détente seemed to take some fans by surprise. One man sitting in the area for the Ukrainian team’s friends and family asked those around him to chant louder “or else I’ll start shouting ‘Maidan’,” a reference to the Kiev square where the ongoing protest movement against ex-president Viktor Yankuovych started last year. They cheered louder, and politics once again receded from view. As Russia took a 4-1 lead in the quarterfinal, which is decided as the best of 10 fights over two stages, reminders of the political tension were never far away, but almost never acknowledged. Friday’s second stage is to be held in the mostly Russian-speaking city of Donetsk in eastern Ukraine, which has seen fatal clashes between pro-Russian and pro-Ukrainian protestors in recent weeks. Kremlin-linked billionaire Gennady Timchenko controls the company that owns the Russian franchise in the World Series and has been placed on a U.S. sanctions list over the Crimea crisis. One boxing casualty of politics, however, looks likely to be the World Series final, originally slated to be held in Kiev. With the current political uncertainty “even [the Ukrainians] will feel it’s not easy to host this,” Wu said. 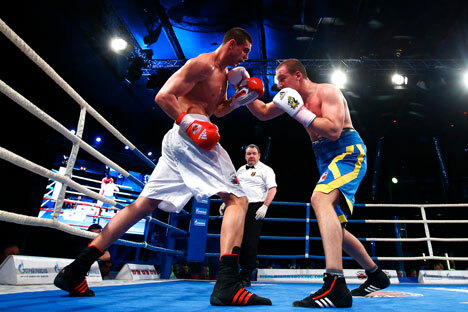 In the second stage of the quarter-final, Ukraine’s fighters face a desperate struggle to overcome the Russians, who now wield an overwhelming advantage. Against talk of war between Russia and Ukraine, Monday in Moscow offers hope that any conflict between the two countries can be confined to the ring.